Blackjack Ketchum, the real-life gunslinger who'd previously been a peripheral character in several westerns, is herein afforded his own feature-length "vehicle". Howard Duff plays the title role, who at the beginning of the film is doing his best to live down his reputation. This proves impossible when land baron Jared Tetlow (Victor Jory) and his brood muscle into the territory. Hoping to champion the cause of his fellow ranchers, Ketchum once more straps on his guns and prepares to do battle against Tetlow's henchmen. 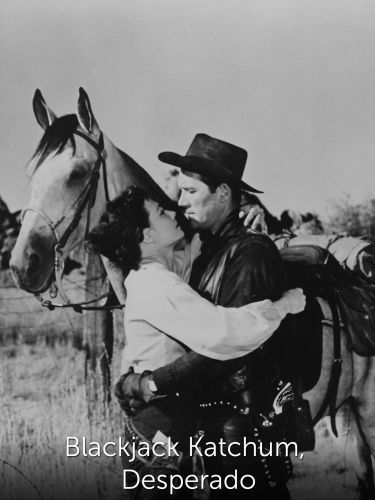 Naturally, Ketchum's sweetheart Nita Riordan (played by Maggie Mahoney, the mother of actress Sally Field) would prefer that Our Hero abstain from gunplay, but.Blackjack Ketchum, Desperado was based on a novel by Louis L'Amour.